UPDATE: We did a video review of these products. Watch it here. Have you ever wanted to try haggis, but you just canâ€™t seem to make it to Scotland for some of that entrails-y goodness? Or, have you ever wanted to experience tapeworm, but you just canâ€™t find the time to hunt down that parasite? If this sounds like you, Archie McPhee has the answer! For a scant $4.95 a piece, you can treat yourself to one of these gastronomical delights. While in Scotland, I managed to avoid sampling this traditional Scottish dish of â€œsheepâ€™s entrails and spices, boiled inside a sheepâ€™s stomach.â€ McPheeâ€™s Angry Scotsman’s version is made of butterscotch gummy and crafted to look like actual haggis. Luckily, it doesnâ€™t taste like it. The tapeworm, a.k.a. the bane of pets everywhere, is a 19â€ long replica of everyoneâ€™s favorite parasite. Its flavor is green apple, which makes sense given its bright green hue. 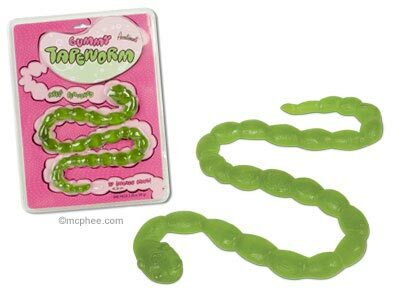 Halloween is right around the corner, and these gross-out gummies would make the perfect addition to a creepy gummy tasting party! I have to add both of those to my must have candy list. Perhaps I can get Wink’s Woods to carry them. That haggis sure has a delightfully disgusting color. I want to try th Haggis… I have never had BUTTERSCOTCH flavored Gummies. They might be heavenly. I would just like to point out that haggis is actually quite tasty. It’s sort of a cross between a mildly seasoned sausage and meatloaf. Aside from the stomach, the organ meat is all ground, so it’s not like you encounter chunks of lung (in fact, most butchers don’t use lung anymore, which is for most people the most objectionable bit.) And the stomach itself is just a membrane that holds it all together, essentially the same as the intestine that is used for making sausage. I encourage anyone who can get their hand on it to try haggis. I guarantee if you can get passed all the trumped up descriptions, you’ll find it’s really not that bad. Hell, most food can sound gross if you describe it in detail. Gummi’s are composed primarily of bovine connective tissue. Milk is technically a reproductive fluid. And cheese is just rancid reproductive fluid. And next time you reach for an energy drink, remember that taurine is a derivative of cow bile. Ahem. Sorry about that. I just don’t understand why haggis gets such a bad reputation. And no, I’m not Scottish. However, aside from all that, the gummi haggis sounds interesting. Butterscotch gummi? How odd. The tapeworm seems less exciting. I think just cause I’ve been eating gummi worms all my life and this just seems like a big version of those. Now, if you’ll excuse me, I’m going to go pour myself a big glass of ice cold bovine reproductive fluid and open a bag of deep fried tubers. I wonder if our govenment, the states, will ban gummi haggis? They are stupid after all. I refuse to eat haggis, because I think sheep are absolutly precious. My ancestors were from Scotland, but I feel no ties to eating poor defenceless sheep. 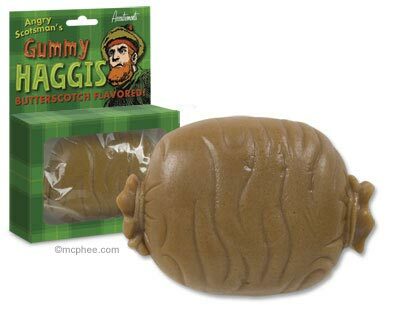 I also would not eat gummi haggis, because it’s butterscotch flavored, but I might get it for my mom.